Next time you go to one of these common restaurants and think you’re doing really great ordering a salad be careful. This is not to suggest for a moment that a salad is not a great choice because it is but just because you’re ordering a salad don’t fall into the trap that you’re doing good you got a be a bit more careful than that. Before we share with you a few tips on ordering a salad here are some examples. 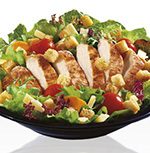 E) Pecan crusted chicken salad from Friday’s over 1300 cal (and you were proud of yourself, ordering it) Salads are terrific to order when you go out to eat but it’s the dressing that typically you have to be most careful about even the low calorie dressings can cause your glycemic index to spike. Suggestion: Vinegar and oil are the best choices experiment with adding a little Dijon mustard and use low acid vinegars (Balsamic, Rice wine, Apple Cider) because the higher the acidity in the vinegar the more oil you’ll want to add to compensate for the acidity to make it more alkaline.